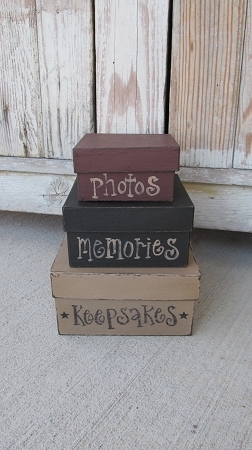 Primitive Keepsakes Photos Memories Square Set of 3 Stacking Boxes. This little set of square boxes are neat for on top of a dresser or cabinet. Stash away all those keepsakes...They are small, but can still fit little treasures inside. Size is 8" High when stacked x 6" square bottom. Colors are khaki tan with Keepsakes, middle is black with memories, and the top is burgundy with photos. Hand painted, designed and signed by Heidi.